There is evidence that Anne did try and forge a relationship with the defiant Mary. On one occasion in 1534, she visited Elizabeth’s household by herself and asked to see Mary. 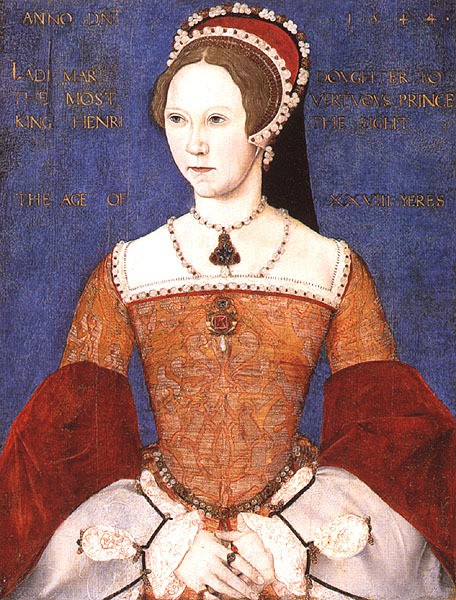 Anne offered to welcome Mary back at court and to help reconcile her with her father if Mary would accept her as queen. Mary’s impudent reply was that she knew of no queen apart from her mother but that she was pleased if the king’s mistress wanted to intercede on her behalf! How Anne must have wanted to slap her face! Anne id in fact try to reason with her, but to no avail. At another time, according to “legend”, Anne and Mary were both in Eltham Palace chapel at the same time. According to the story, an attendant told Anne that Mary had acknowledged the Queen before leaving the chapel and Anne, embarrassed at not noticing and pleased that Mary acknowledged her, sent a message to Mary apologising for not noticing and saying that she desired this to be the start “of friendly correspondence”. Mary swiftly replied that she had knot acknowledged Anne and that the queen could not have sent her this message because it was from Lady Anne Boleyn, not Catherine! A spirited reply! Anne tried again when when Catherine was dying. She asked Lady Shelton to tell Mary that the queen desired to be kind to Mary and when Catherine died Anne sent a further message saying that if Mary would obey the King she would find a second mother in Anne. Again, Mary did not take kindly to this and replied that she would obey her father only as far as her conscience would allow. I don’t think we can blame Anne for giving up at this point! Fancy A Game Of Cribbage?